People have been complaining about the command line interface (CLI) of NeoRouter server, when they want to manage and setup their domains. Most of them are Linux/Unix or Mac users and some of them never use Windows system, therefore they don’t have a chance to use the Windows based Configuration Explorer tool. Though the NeoRouter client CLI tool on a non-Windows platforms seems acceptable, people wish they could have a GUI client. Not to mention the mobile users, who want to access the remote machine from their smart phones. How? It’s been a challenge for us and it also means a lot of work to port NeoRouter software to other platforms. 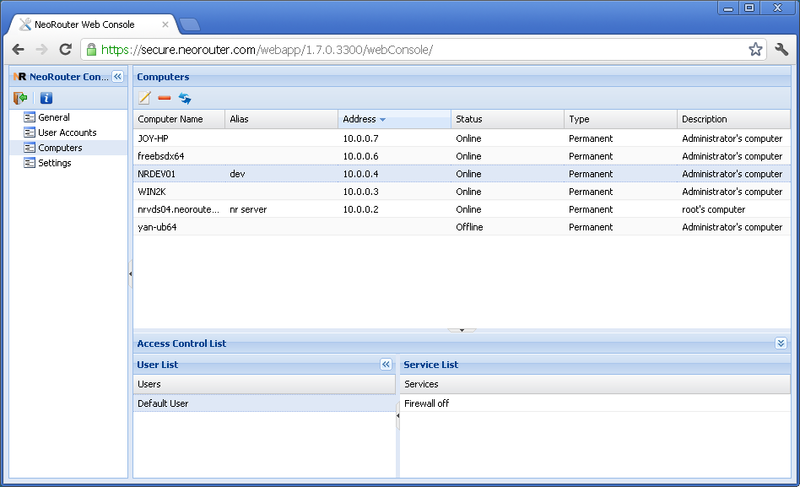 The web based Configuration Explorer has the same feature as the Windows based application. It means one can easily manage the NeoRouter servers running on any platforms, no matter it’s Linux, Unix, Mac or in-a-box devices. 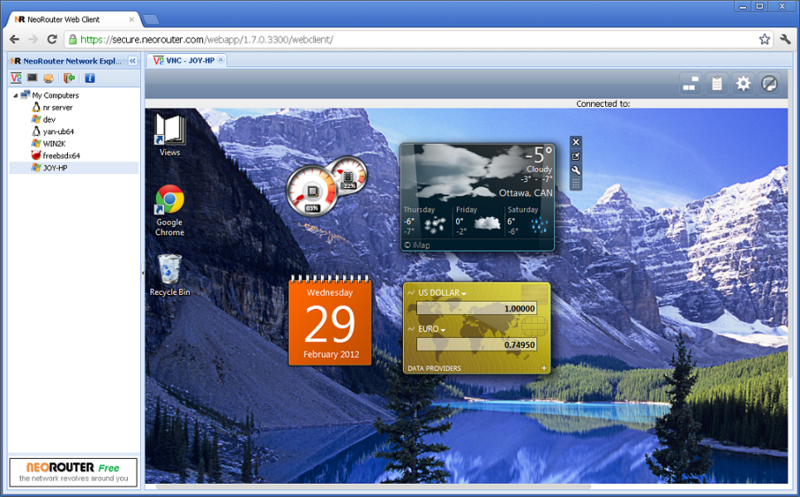 VNC client, which supports all VNC servers running on any platform. 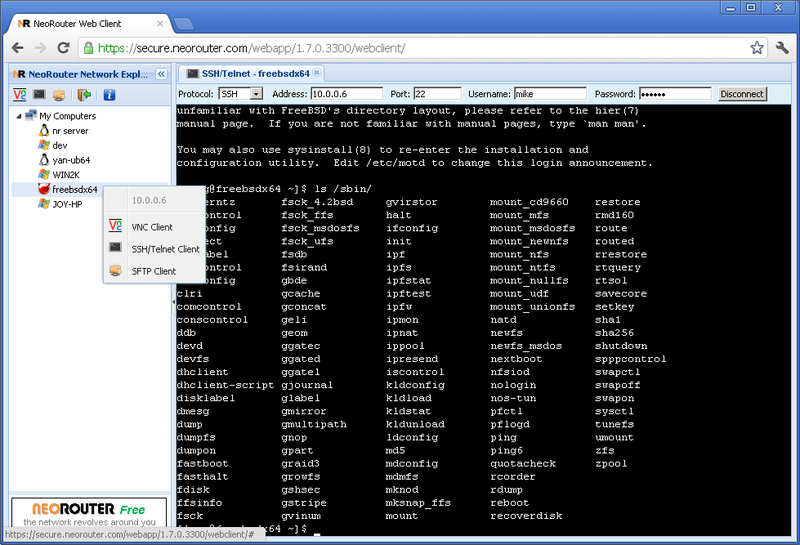 Telnet/SSH client, which allows you to remotely connect to any computers in the NeoRouter virtual LAN. Besides the standard SSH server on Linux/Unix/Mac, it also supports FreeSSHd for Windows. 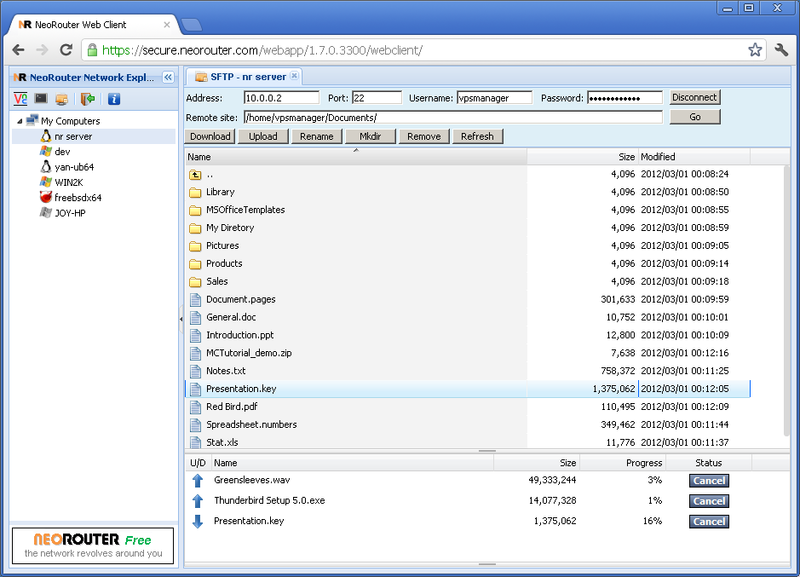 SFTP client, which give you a way to exchange files between your client machine and the remote SSHd servers. You can easily upload/download files, create new folders, delete files or rename files. What’s the next step? RDP Client support and mobile versions. Stay tuned and it’s coming soon! You are currently browsing the NeoRouter blog archives for March, 2012.